When looking for the best fishing in Florida, offshore deep water sportfishing remains one of the most popular ways to enjoy your boating experience. Waters beyond the Continental Shelf are considered offshore and this kind of deep sea sportfishing is quickly growing as a sport. Because the reefs and depths that these waters present more opportunity, the realm of offshore sportfishing is one that you will enjoy once you have some experience. But that's not to say you require experience to enjoy your sportfishing adventure, in fact it's easier than ever for beginners to start. When you want the best in offshore fishing that Florida has to offer, there is much the Atlantic and Gulf has to offer. For beginners, you can begin with the reef line that's located just of the east coast shoreline. WHAT IS OFF SHORE FISHING? 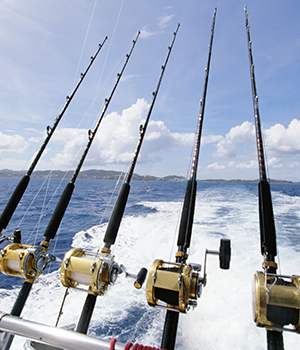 Offshore or Deep sea fishing is a form of angling that takes place in deeper parts of the ocean. Typically offshore fishing describes waters that are more than 30 meters deep, providing fishermen with a truly unique chance for a rewarding trip. Some of the other terms associated with offshore fishing are deep sea fishing, sport fishing, and big game fishing. As the sea floor begins to deepen, the terrain of the ocean bed creates feeding grounds as the ocean currents sweep bait across canyons and valleys. Creating fertile trolling grounds for surface feeding fish, these deep sea regions provide the perfect backdrop for some of the biggest gamefish you could ever take aim at. When sport fishing try to locate these potential hotspots, and fish near reefs or trolling grounds where large fish come to feed. Reefs and natural deep ocean formations also produce their fair share of wreckage, which is perfect when offshore fishing. 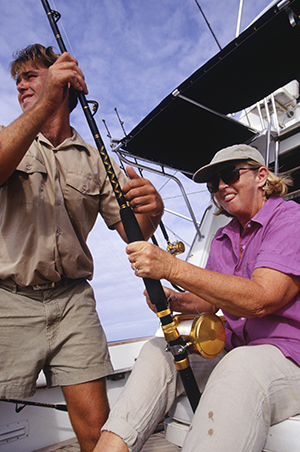 Offshore reefs are home to many of popular fishing targets for bottom-dwelling fish like the snapper and grouper. Fishermen who are looking for big game fish like the marlin, big tuna and swordfish have more tools that ever to find the fish they want. Once a sport that was reserved exclusively for seasoned anglers, technology has made it easy for anyone interested in sportfishing to locate the fish they are after. Fishermen have been trying to unlock the secrets of the ocean for years now, armed with limited knowledge of these natural conditions. Advancements in nautical and sportfishing have closed this gap and given sport fisherman confidence to enjoy a deep fishing adventure. Combining elements of exploration and the chance to battle a 350 pound Marlin on the same day, make for a truly appealing deep experience. Factors like ocean currents and tidal breaks were once keys that only the most experienced fisherman could decipher. Today's boating and fishing tech has fisherman on the cutting edge, which can result in greater yields for your offshore foray. 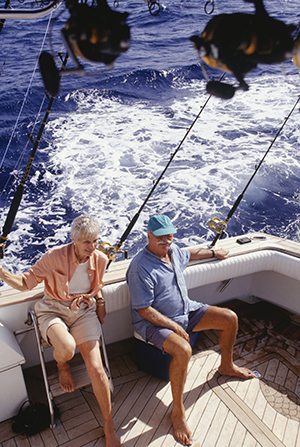 Reach these fertile waters by properly outfitting your long range vessel or fishing yacht, and realize your sportfishing adventure in luxury with a new or used yacht from Woods and Associates. 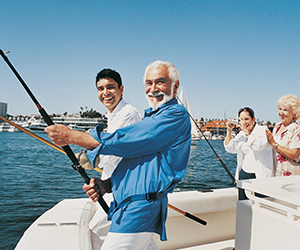 No matter what yacht you choose from our extensive lineup, you are getting the best in luxurious accommodations with all the options for any level of angler. Undertake an offshore fishing trip unlike any other with a Hatteras fishing yacht that has propelled many anglers to the winners circle. 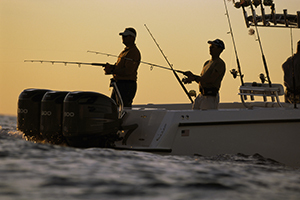 Perfect for the offshore sport fisherman as well as the weekend cruiser, the Hatteras brand provides luxury boating for the most discerning angler. 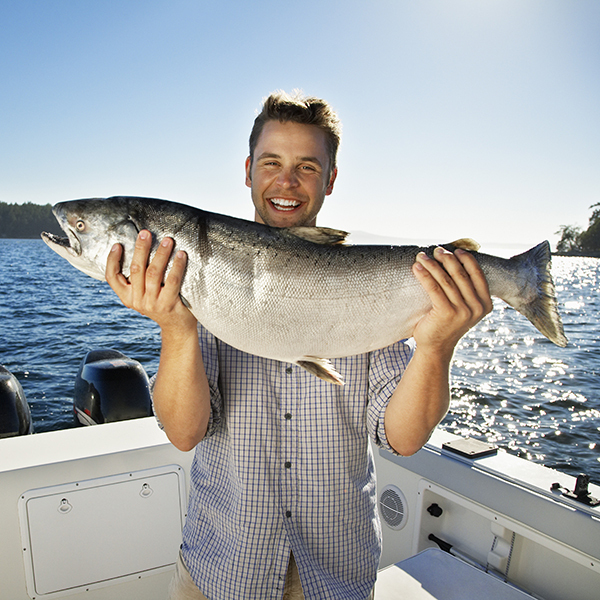 The purpose of deep sea boating is to enjoy yourself and have fun while fishing in a new and exhilarating way. It won't be much fun if you are in the wrong size boat or one that's not prepared to handle the rigors of the deep ocean waters. Even if you have all the techno-gadgets you could ever want, experience still plays a large role in your deep water fishing success. Keep your mind open to the telltale signs of nature to help you gain the edge over your peers. Don't forget to do the proper research to find your best offshore fishing in Florida. To maximize the chances of a successful deep sea fishing expedition depends on a variety of factors. Make sure you are well versed in them to avoid being skunked on your fishing trip. Depending on the conditions of the sea, atmosphere, tidal changes and movement of fish, productive analysis can go a long way in planning your next offshore fishing trip. With so many things to plan and take care of, eliminate one of these factors by choosing the best name in luxury yachting, Hatteras. Check out our used Hatteras yachts for sale. Versatile enough for multiple configurations and backed by an innovative fiberglass design that's been the best in the industry for over 50 years; Hatteras is the elite choice of deep sea fishing yacht. No matter which model of Hatteras excellence you are boating from, find your best new or used yacht value with Woods and Associates. Tournament ready and spacious configurations can provide a level of luxury and comfort for your deep sea sportfishing experience. Unmatched flexibility and superior design make Hatteras the deep sea fishing yacht the best choice for anyone who wants luxury without compromise. The latest news about Sportfishing!